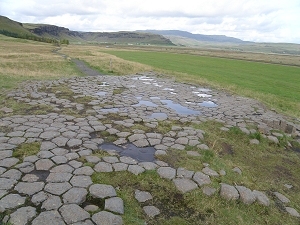 The links on this page were originally provided for the participants in the Iceland Study Tour run by the Wilmslow Guild, and organized by Ffestiniog Travel in July 2011, and led by Roger Suthren. 1 September 2011. 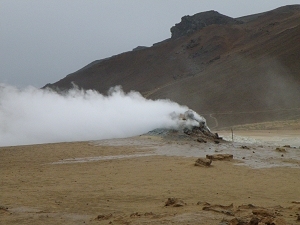 Iceland Directs Avalanche Funds Into Volcano Risk Studies. Iceland Met Office report on volcanic risk assessment. Sturkell, E. & Sigmundson, F. 2003. Recent unrest and magma movements at Eyjafjallajökull and Katla volcanoes, Iceland. Journal of Geophysical Research, 108. The Holuhraun lava eruption which started in August 2014 and ended in February 2015. 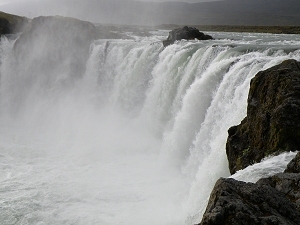 Over 1 cubic km of lava was erupted, and volcanic gases affected large parts of Iceland, varying with wind direction. Glacial outburst flood in Skafta River, 28 July 2011. Iceland Review article. A glacier-outburst flood from Katla volcano on 9 July 2011 destroyed the Múlakvísl bridge on Highway 1, the main road along Iceland's south coast. The bridge was replaced a week later by a temporary bridge - an impressive feat considering the new bridge is 150 metres long. 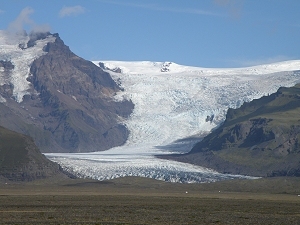 There is continuing earthquake activity at the Katla caldera under the Mýrdalsjökull ice cap - see daily updates from the Icelandic Met Office. It is unclear whether this is related to an eruption. Volcanic Ash - Effects on Transportation and Mitigation Strategies (USGS). A description of the effects of volcanic ash on transportation, including roads, railways, and air transport systems, and ways to minimize the potential impacts of ashfall.